The Bibliophilists | Reading the library, one book at a time. I’m a big fan of books (obviously), and I love books in novelty form. Have you seen the book on a single poster thing? 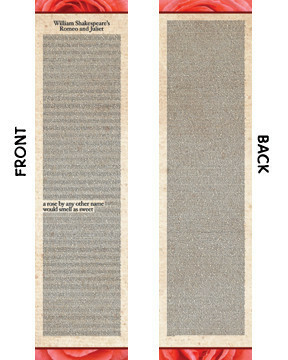 Well, someone has taken that a step further, and put the entirety of Romeo and Juliet on a bookmark. Yep. A bookmark. How meta can you get? How neat is this? I know what I’m asking for on my next Birthday! 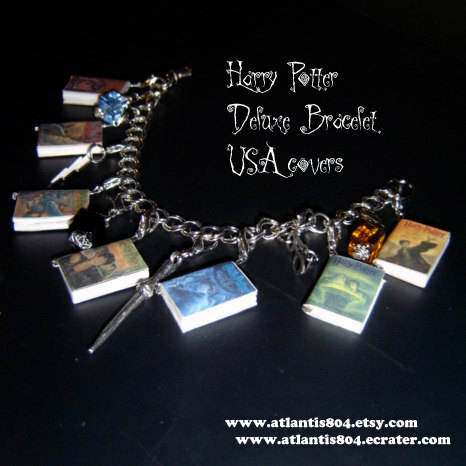 If you’re anything like those of us here at The Bibliophilists, you can’t get enough of the Fire and Ice series (or, as those who watch the TV shows, the Game of Thrones series). You also have been anxiously waiting for the next entry of the series (seriously…what is going to happen with Dani!?!). Well, Mr. Martin, in his wisdom, has decided to satiate his rabid fan base for the moment by putting a snippet of the newest book up online. Go! Enjoy! Discuss! Drink! Four years ago I wrote the last post on this site. That year I started a PhD program at the illustrious Texas A&M University, which ended up taking all of my time and energy. Unfortunately, this meant my goal of reading all the books in the library had to go by the wayside (although I did make a great dent in reading text books, so I suppose things still moved along, albeit much more slowly). Now I’m back! I have stacks and stacks of books that I’ve set aside to read, and a personal library that just keeps growing. Here’s to a new chapter! First Book has partnered with Disney to publicize the upcoming Adam Sandler movie Bedtime Stories. For every comment posted on the First Book’s Blog, Disney will donate a book to a needy child. As of this writing, there were 313 comments. Join the fun! Woo! 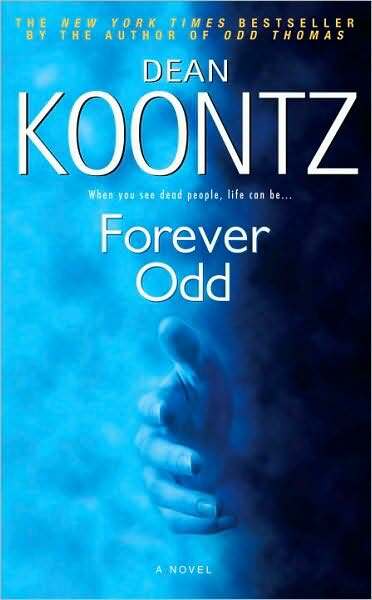 Odd Thomas!! This is the second book in the wildly popular Odd Thomas series, and was I ever excited to pick this one up. The story follows our hero on another adventure. This one starts soon after Odd Thomas finishes, so Odd is still grieving the death of his beloved Stormy (sob!). He is found by a crazy woman who searches the globe for evidence of the supernatural, and forces Odd to fight for the life of a friend. The story wasn’t as good, in my opinion, as the first, and I’m not sure why that is. It may be simply because I was so enamored with Odd Thomas that any followup story paled in comparison. Whatever the reason, I wasn’t as impressed this time around as I was the first. It was still an interesting read, and whenever you are in love with a character, it is a good thing to see them again, so I enjoyed it at least for that. Maybe I’ll read it again, after the glow has worn off the first one and see if my initial impress has changed. This author has been nominated for a Newbery several times, and if you look at her stories you’ll see why. She seems to specialize in “coming of age” stories for young girls–you know the type…the main character is a pre-teen girl who has a problem with gossip, or bullying, or being mean, or something of that nature, and must learn a life lesson in 150 pages or less. What nice about this author is she always gives the books a taste of the supernatural in some way or another, which makes them just that much more interesting. Ella Enchanted is the book the Disney movie of the same name was based on. The story is of a young girl who received gifts from her fairy god mothers on the day she was born, a la Sleeping Beauty. Her last gift was bad, however. She was given the gift of total obedience–she had to obey any direct command. She grew up with this burden, learning the intricacies of the spell, until one day it led her on an adventure of life and love. The story was sweet, the ending was Disney perfect (in fact, the entire book was practically written like a Disney movie) and the overall feel was nice. The only problem I had with the book were those inevitable moments of discomfort that are so prevalent in these types of stories. Our heroin is put into some embarrassing situation due to her condition. I’ve always hated that. I don’t even like sitcoms because of that sort of thing. However, despite the embarrassment factor, I still enjoyed the book. Gah. Heh…ok…breath…. Alright, I think I’m finally ready to write a review for this book. I’ve started several times, and it went something like this; “Hatehatehatehatehatehatehatehate!! !” So I had to get some distance from this story before I could really decide what made me so angry about it. Let’s look at the story itself, first off. This book is one of the many that came out in the wake of The Davinci Code, touting jacket blurbs like “The next Davinici Code!” and “If you like The Davinci Code, you’ll LOVE The Eight!” Lies, all of them. But I digress. So I got this book from a friend with no real recommendation–he just handed it over and walked away. I see why now. The story is of a woman who gets wrapped up in a mystery. Over several thousand years, a set of chess pieces has been scattered all over the earth. It is rumored these pieces hold a great secret–one which kings have been attempting to harness since the beginning of time. The woman, an American computer contractor in Iraq, follows the clues in an attempt to unravel the mystery. She encounters danger and adventure along the way. So, sounds good, right? That’s what I thought! That is, until I actually started reading it. The general premise is great–the mystery was interesting, the back story wonderful, the fact that it was a mystery through time just gave it that much more oomph. However, for some reason the author just couldn’t pull it together. A good adventure mystery needs to have pace–a focus on the excitement, buildup to a great payoff, a twist or two, and a grand ending that leaves the reader gasping for breath. This had all the set up for that, but none of the delivery. The author seemed to get bogged down in details–but the wrong details. I remember reading four or five pages describing a meal the main character had, with wonderful descriptions of the drinks and the food and the scenery and the in-house entertainment. All well and good, except it had nothing to do with the story line. No bit of information gathered from that meal ever came up again…the action happened afterwards. What really irked me was after reading several of these scenes, the author completely crapped out on what could have been a great ride. She has a character enter a scene, and, in three sentences, describe a grand adventure the character embarked upon to find a missing piece of the chess set. Now, this would have been some great reading. There was a puzzle that needed to be solved, major obstacles, a pitched battle, a near death, and grievous injury. How wonderful would that have been?!? But no–instead we get pages about the texture of blended yogurt, and two sentences summing up a major part of the story line that happened somewhere else. This happened several times. It was almost as if the author didn’t think she had the ability to really craft a great adventure, so relied on recaps to get the information across. Come on! If you’re going to write a mystery, at least do it right! It took me a long, long time to get through this book. I wanted to like it; I love the genre, and there is nothing better than a really great puzzle mystery. But the author just wouldn’t let me–I’m not sure you could write a worse mystery if you tried. If you see this book, run far, run fast, and pick up The Rule of Four instead. What a good story! This is what a good puzzle mystery should be. There was intrigue, there was mystery, there were fascinating puzzles that just begged to be solved. Now, it wasn’t the best thing I’ve ever read, but puzzle mysteries can be hard. The author must craft a believably tough puzzle that is still solvable. These puzzles worked really well, but I think they were a bit too complex, and the solutions took too long to explain in a satisfactory manner. It would have been better to not explain them so throughly and just let the reader’s imagination take over. It was still a great story, however, and was very hard to put down. The ending was most satisfactory, and I highly recommend this to anyone who wants a good puzzle read steeped in myth and history. Same review as the first, but with a much sunnier feel due to the location change. I’m glad not all of them are as dismal as the first, since I don’t think I could have taken much more dark/grimy/dirty/sloven/etc. -ness. Completely mindless, but fun. I don’t really see the draw of these books, but they’re harmless and quickly over. I finished 2 full books in this series while waiting in a waiting room (though admitedly I was there for like 4 hours). 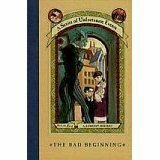 This is the first book in the series, and tells how three main characters become orphans. But really that’s over with on the third page or so. After that, there are frequent references to how lonely and sad the children are, but not much more about the circumstances. The book was clearly written for children, so there are a lot of: “I feel disappointed. That means I am not happy with how things turned out.” “We know what disappointed means! Get to the real point of why you’re disappointed!” But you read that and thought that was just me complaining about the book not getting to the point, didn’t you? Nope, I mean that to be a paraphrase of what the characters actually say to each other. About 20 times in the 30 page book. Though I didn’t really count. But the definitions they use aren’t bad, and in some cases I was struck by how applicable the definition given was to the book’s use of it. Anyway, I wouldn’t recommend it exactly, but I did enjoy it enough to read the second one I’d already bought. Probably not enough to buy anymore though. Now you too can smell like old books and librarians! I’m actually very intrigued by the In The Library product, which promises to bring back scent memories of happy hours spent among books. Want! I like series. You know, those books that take you through the lives of people in a particular region. Doesn’t matter if they are imagained, real or sci fi. I like knowing how someone else envisions their lives, who the interact with and what they do. This author does a good series. Coel could so easily revert to the tried and true banal of “silly little mysteries”, but instead develops characters and situations that are plausible, maybe even probable. She includes threads of history, both ancient and modern, real life situations facing native Americans, and complicated relationships to tie it all together. Yes, it does have a love affair, another guy who wants the woman, and gossip, but it somehow works in her books. Based on the tragedy of Wounded Knee, from the 1970’s, the story takes you through the discovery of a 30 year old murder and the insuing investigation, complete with death threats, more murders and last minute salvation. A nice read. A simple, easy to read series that is one of those that you read and wonder why you wasted the time, then eagerly pick up the next book and do it all again. Plots are easy to predict, characters attempt to be interesting, homey, but end up being sachrine. The basic plot centers around an episcopal priest, who is what everyone wants in a church pastor. Even though Karon attempts to show his humanness, a sense of impossibility surrounds all the situations. A bit heavy on “altar calls” and prayers, the book reads like most “Christian” novels, do this and you will walk the golden streets in heaven. Still the people are fun, the recipes interesting and the read easy. One can go to work and still read the 8 books in a little over a week.